Cardinal celebrates Masses for Catholic Schools Week. Published 2/2/2018. Local. NEWTON -- A morning Mass celebrated by Cardinal Seán P. O'Malley at Mount Alvernia High School in Newton, Jan. 29, helped kick-off Catholic Schools Week in the Archdiocese of Boston. Held annually since 1974, and beginning on the last Sunday in January, National Catholic Schools Week calls on dioceses across the country to celebrate Catholic education. Typically, schools will observe the celebration week with open houses, Masses, and other activities for students, families, parishioners, and community members to shine a light on the value of Catholic education. 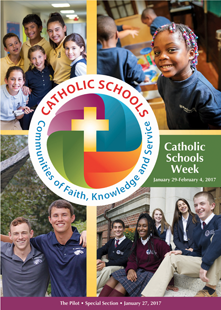 This year, Catholic Schools Week runs from Jan. 28 to Feb. 3, and is themed "Catholic Schools: Learn. Serve. Lead. Succeed." Cardinal O'Malley celebrated the Mass at Mount Alvernia High School, an all-girls' school, in recognition of the week. The school chapel was filled to capacity for the Mass, which saw students and faculty joined by sisters of the Missionary Franciscan Sisters of the Immaculate Conception, the founding order the school, and Kathy Mears, the archdiocese's superintendent of Catholic schools. In his homily, Cardinal O'Malley said that Catholic schools, in addition to providing students with an excellent education, also prepare them for life with "important skills." A Catholic education can "help people to have a vision of the value of things that technology can't," he said. The society we live in, the cardinal continued, can be so focused on the self, and the world is filled with loneliness. Yet, that is not the Catholic plan for the world, as "we are here to take care of each other," he explained. It is through a connection with God, and love for others, that the world may be changed, Cardinal O'Malley said. Love is what our vocation is about, he continued, and "Catholic education is about building a civilization of love." By following Jesus, we become more free to serve, to heal, and to love, said the cardinal. We become more merciful and generous, and find happiness. In making a gift of ourselves to God and to others, ultimately, we find salvation, said Cardinal O'Malley. "That's why we have Catholic education -- to help us in that process of discovering God's love and then responding to it," he concluded. In a short address following the Mass, Mount Alvernia High School Head of School Eileen McLaughlin spoke about her own experience being educated in Catholic schools. She learned the basics in school -- math, history, science, English -- but she also learned so much more, she said. Through her Catholic education, she learned about hard work and the goodness of God, and discovered that she was created with a purpose, and held all the tools and skills needed to carry out that purpose. Later, in a professional capacity at Mount Alvernia, she said she learned even more, learning about prayer and peace from St. Francis. Addressing the students, she said "You too have been beneficiaries of a Catholic education that your parents have sacrificed to give you." "Take into the world not just the lessons of math and English and history," but take the faith that your parents have and gifted you with and "take it into the world," she said. "Each day, become an instrument of peace; choose to become an instrument of peace. Be peace and goodness in the world," she added. Following the Mass, Cardinal O'Malley was given a tour of the school, visiting several classrooms before blessing the school's newly renovated library. Several students were present for the blessing, and held a small question-and-answer session with the cardinal afterwards. Speaking to The Pilot, sophomore Kristine Simmons said her school is "a community where everyone comes together in the spirit and in the faith," and added that the Mass with the cardinal "strengthened" that community. "It was a great Mass where we were together as one," she said. Standing beside Simmons, sophomore Emma Canning said that Cardinal O'Malley's homily during the Mass "made me realize how lucky I am that my parents sent me" to Mount Alvernia. "I've gotten Catholic education my entire life," she said, so the homily "just made me feel lucky." Also during Catholic Schools Week, Cardinal O'Malley celebrated Mass with students and faculty at Sacred Heart School in Kingston, Jan. 31 in conjunction with the school's Founder's Day. The Mass was dedicated to the Sisters of Divine Providence who, in the fall of 1948, opened Sacred Heart School, kindergarten through grade 7, on Court Street in Plymouth. Over the next 14 years, the sisters built both the high school and the elementary school in Kingston, as well as a residence for the sisters. The school's peer ministers, under the guidance of Andrea Hurm, prepared a special liturgy during the Mass presided by the cardinal. Several Sisters of Divine Providence sang "Ave Maria" at the Mass, after which there was a small reception for Cardinal O'Malley hosted by Sacred Heart School president Sister Myra Rodgers. "The entire Sacred Heart community is honored to welcome Cardinal O'Malley and have him officiate at this special Mass," said Sister Myra Rodgers, president of Sacred Heart Schools, before the Mass. "We are delighted that the cardinal will help us tribute not only the Sisters of Divine Providence -- the founders of Sacred Heart School -- but likewise the faculty, staff, parents and grandparents who through these 71 years have supported and encouraged the growth of the school."